With just one phone solution, business executives, agents, and investors can engage voice communications, organize business conferences, online meetings, and much more. With it’s cloud-based structuring, RingCentral eliminates the need for additional costs that come with a physical communication set up, like hardware, software, maintenance, training, space, operators, etc. This means businesses save time and resources without compromising communication capability and quality. On top of that, this software unites all locations, and helps you work just as good offsite as you do onsite. It is due to the strong mobile support for both Android and iOS that you will get to keep your remote team connected and organized, send and receive HD calls, faxes, SMSs, attend conferences, and receive notifications regardless of your current whereabouts. The mobile features, however, don’t only allow users to communicate with each other, but also to administer their business processes. Satisfied customers noticed that RingCentral performs just as good when mobile as it does within the office, as you get grasp on all functionalities related to settings configuration, extensions management, call direction/redirection, hosting meetings, and even reporting. Using such truly mobile PBX, the company can comfortably eliminate traditional offices and switch to virtual ones in cloud. It is only such impeccable functionality that can minimize administrative costs, alongside the ones large companies usually make in order to communicate. Considering the system’s power to integrate with the most important apps in your software landscape, we believe RingCentral will cut even some of the expenses related to purchasing additional file sharing or CRM systems. What is really important to consider in the RingCentral case is flexible pricing – the three different packages are priced in a way which suits businesses from all scales and industries, varying from $24 for small companies and startups to $44 for large enterprises. Users are encouraged to make use of the 30-days absolutely free trial and examine the features in order to choose the most appropriate package. There is a long list of reasons why so many prominent businesses choose to work with RingCentral as their main communication platform. RingCentral invokes the ‘wow effect’ from the very beginning, as soon as the user realizes he can migrate smoothly from whatever landline or cloud system he may be using. Even for small and midmarket companies, RingCentral provides enterprise-grade communication capabilities, including calls, fax, text, BYOD, and mobile apps. It doesn’t really matter how your software landscape looks at that moment – RingCentral offers just the right integrations to make the system blend inside (Microsoft, Salesforce, Dropbox, Google, Zendesk, and many more). Managing the system will be just as easy as it is to set it up, and there will hardly ever be a need to consult technicians or spend money on expensive training and repairs. Once it introduced the concept, RingCentral assumed responsibility to transform it, optimize it, and innovate it as frequently as possible. There is no costly hardware or maintenance involved, and you still get the sophisticated PBX you need. RingCentral is among the rare communication systems that can boost with optimized emergency uptime in case of poor or no Internet connection. Together with it, you will receive numbers for toll-free international/local calling, enterprise-grade security for your data (both physical and bio-metric), and Tier 1 data center for cloud hosting. Features such as multi-level auto attendance and wide phone menus will ensure faster and painless user adoption, and will help you regain total control regardless of the number of users, extensions, or locations. On top of that, you’ll get to work in a beautifully designed system that can be navigated with ease, which is a rare diamond in the communication software industry. You just can’t expect less from a system that lets you run it the same day, and where you get brand new IP phones sooner than with any other program. From the very first moment you log in, the system allows you to create and configure extensions, manage call forwarding, routing, or blocking, and enable auto call attendants in a systematized way. Unlike traditional systems that would either take time or not perform similar tasks at all, RingCentral automates the process, and gets things done in less than a day. Our experts were impressed by the fact that RingCentral handles complex phone configurations the same way it transfers contact numbers for simple ones, and makes the transition simple to help least-savvy users cope with it without training. In fact, the manipulative and responsive interface is often considered to be the strongest side of this system. According to the vendor, RingCentral has a decade of R&D backing and over 300.000 deployments which perfect its functionality. Nevertheless, the back-end user gets to work on an easy interface, where even non-technical administrators can handle complex operations. The key breakthrough is the elimination of technical configurations, enabling users to work around their own rules and manage homegrown extensions. To make matters even better, separate rules can be assigned to separate users, groups, and departments. Using RingCentral, companies experience a record reduction of repetitive tasks and hours spent on managing batch templates, and are happy to have a whole new set of convenient options for editing those templates. Customization was, is, and will continue being the focal point in this PBX, as users tailor settings depending on their role and location. In a scenario like this, the user can set up multi-level call-flow configurations, allow callers to dial employees and reach local lines, link direct numbers to trunk lines to access external parties, and so on. As much as 250 voice menus are available for each account, which is more than enough for identifying issues and misconfigurations. Among other features, prospective buyers should also consider the option to forward calls on private numbers, the automated group creation, diverting unanswered calls to the next person in charge, using Internet fax, and sending Business SMSs. As user-centered as it is, RingCenter makes most of these advanced features available even in the most basic package, and offers a free trial where one can test their effectiveness. The rule is simple: You can’t expect a PBX to handle external communication as it should, if it can’t do the same with the internal one. RingCentral is a master of the offsite working craft, as all of its functionality is available on mobile devices with nothing but a stable Wi-Fi (3G/4G) connection. The reason is that employees’ smartphones are instantly transformed into BYOD line extensions, and calls can be easily redirected to them. As we already mentioned, there is no restriction as to what type of administrative functions you can perform on a mobile device. The bandwidth quality is simply exceptional. How many systems can you think of that have impeccable performance in case of emergencies? RingCentral is known by its business continuity in cases of poor, but even completely lost Internet connection. What the app does is to switch to cellular voice and data networks as soon as a problem happens, and the administrator can easily go on with his tasks. North American customers who call your RingCentral toll free number won’t pay a dime to engage with you. The cost on your side will be as low as 3.9 cents/minute, and that’s only after you’ve exceeded your 1,000 toll free minutes. International calls, on the opposite, cannot be received on the toll-free number, but can easily be forwarded to any international number you like or have available. Another thing that makes RingCentral special is that it allows you to keep your toll-free number even after you’ve stopped using their services, which makes the product one of the most risk-averse and viable PBX solutions. From the information we shared so far, it’s not difficult to conclude that RingCentral cuts operational costs, and showcases results right away. If you’re scouring budgets, you may want to consider that this product doesn’t require hardware installations or maintenance, neither will it demand you to purchase expensive licenses for functions you won’t even use.Most functions are unlimited and won’t charge extra upon exceeding. An interesting fact is that international customers report saving as much as 30% on oversea calls and teleconferencing expenses. Every enterprise has different needs and needs a software that can be personalized for their size, kind of employees and customers, and the specific industry they are in. For these reasons, no system can proffer perfect features out-of-the-box. When you search a software product, first be sure what you need it for. Read some RingCentral reviews and ask yourself do you want basic features or do you need complex features? Are there any industry-specific features that you are seeking? Obtain the answers to these questions to aid your search. There are multiple elements that you need to consider and these include your finances, specific business needs, your organization size, integration needs etc. Take your time, try out a few free trials, and finally zero in on the system that provides all that you require to improve your organization efficiency and productivity. We realize that when you make a decision to buy Business Phone Systems it’s important not only to see how experts evaluate it in their reviews, but also to find out if the real people and companies that buy it are actually satisfied with the product. That’s why we’ve created our behavior-based Customer Satisfaction Algorithm™ that gathers customer reviews, comments and RingCentral reviews across a wide range of social media sites. The data is then presented in an easy to digest form showing how many people had positive and negative experience with RingCentral. With that information at hand you should be equipped to make an informed buying decision that you won’t regret. 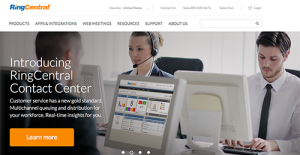 What are RingCentral pricing details? What integrations are available for RingCentral? Pros: One time, when I was on chat with the tech support team to resolve an issue, the chat got disconnected. But, the agent called me on the phone and resolved the issue satisfactorily. This shows the vendor provides top notch customer support. Cons: I am a partner of the vendor and I wish the system included a dashboard that allows me to manage the RingCentral phones of multiple clients. Pros: Very customizable (but at the expense of simplicity), IP solution, good sound quality, additional features like Glib. Cons: Customer service is awful to get in touch with. I have waited over an hour to talk to someone for critical issues. For example, the hours weren\\\'t working so I called in during the day and the customer service agent was pleasant and we appeared to find the issue and fix it. The next day the hours were still off. So I called back into customer service and was on hold for over 80 minutes! By the time I spoke with them, I couldn\\\'t test the fix so now must wait another day to see if it is fixed and if not call back in in the hopes that I can get through in less than an hour so the issue can be troubleshooted. Another issue is in the estimate. They told me to expect a cost of 7-10% of the lines in taxes and fees. I am currently paying 50% the cost of the lines in taxes and fees! They are quite deceptive with these. My prior carrier was close to the 10%. Very customizable (but at the expense of simplicity), IP solution, good sound quality, additional features like Glib. We don't use or need many features of this product. Quality is fine. My qualm is with billing and customer service. Its conference call feature and it works on laptop and mobile. I like the fact that each user can set up customization according to their needs. Other useful features are call recording, call logs, and multiple ways to manage calls. I am impressed with RingCentral’s flexibility as it allows you to take calls on a designated phone as well as on your mobile phone.